In what the Red Cross is calling the worst disaster to hit the United States since Superstorm Sandy, the Louisiana floods of 2016 have destroyed or damaged thousands of homes. Also left behind are thousands of animals whose owners, for whatever reason, were unable to secure shelter for their pets before disaster struck. Coordinated rescue efforts are underway, from Pilots N Paws to local animal shelters that are now overflowing with displaced dogs, cats, horses and other animals. And then there're folks like Josh Pettit, who are just doing what they can to help. Pettit is a Louisiana man. He's spent the last several weeks in a boat, patrolling the streets of Maurepas, east of Baton Rouge, rescuing people from the ever-rising waters and providing other assistance as he can. On August 14, Pettit was in his boat again, watching out for signs of trouble. Suddenly, his sharp eyes caught the movement of a bush -- not swaying with the water's current, but shaking. 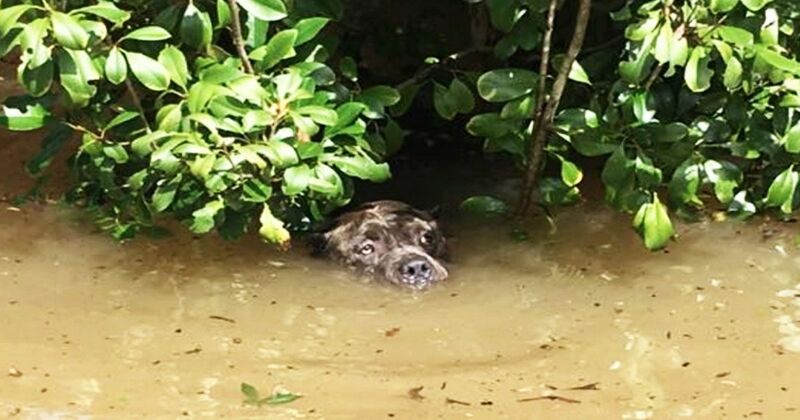 When Pettit and his friends maneuvered their boat to the shaking bush, they discovered a large dog fighting for her life amid the rushing floodwater, eight feet deep. "Eyes and nose barely above water," Pettit wrote later on Facebook. "She could barely tread water anymore; she was so worn out." The men got the dog into the boat. "She came [and] laid her head on my lap and cried and moaned like a big baby!" Pettit said. "She was thanking me." By coincidence, the next person rescued was a veterinarian. Pettit took the veterinarian to dry land, dropping him off with his animals and the nearly drowned dog. It is unclear how, but the dog's owner found Pettit and eventually tracked down the veterinarian that was fostering his dog, a female named Sadie. Sadly, most of the thousands of animals rescued from the floods will never be reunited with the families that are missing them. There are a few public Facebook groups such as Louisiana Flood Animals and Louisiana Flood - Lost and Found that are doing what they can to help. The New York Police Department was able to track down the Mercedes-Benz SUV in the Bronx. What they found shocked them. While on a solo hiking and rappelling adventure, Zak Anderegg made a discovery that would change two lives forever. Kiki the bulldog was likely kept in a small crate for the first part of her life, but now she has people who will not give up on her.